This is the cover June 1985 cover of National Geographic. The image is of a young woman with green eyes in a red headscarf looking intently at the camera. 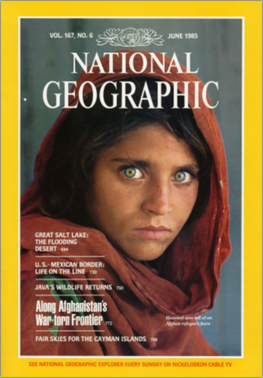 The image had (and still does) such an effect on people she has come to be known simply as the Afghan Girl. The photo has been likened to Leonardo da Vinci's painting of the Mona Lisa. The image became brought a face to Afghani refugees during the Soviet occupation of Afghanistan. Her image helped spark compassion in the Western world towards those in some distant Pakistani camp. It wasn't until early 2002, that McCurry, and the world, learned who she is. ​Click HERE to learn more about the story behind the cover.